Blood pressure, which can go low or high occasionally is important for the proper circulation of oxygen and nutrients to the organs and tissues. So how is the blood pressure generated? Simple, with every heartbeat, the heart pumps out blood that creates blood pressure. This blood pressure changes throughout the day with your body position, temperature and health conditions. Some health conditions cause low blood pressure also known as hypotension, where your blood pressure is below 90/60 mm Hg. The normal blood pressure is 120/80 mm Hg. 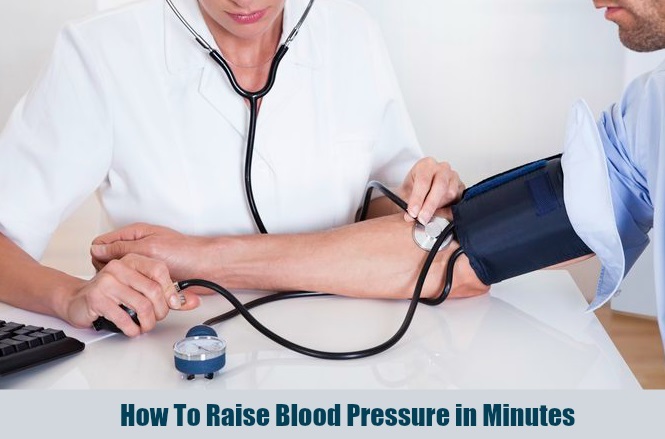 In this article, we will discuss how to raise blood pressure in minutes. How To Raise Blood Pressure in Minutes? Sodium increases blood pressure, but excessive intake of sodium cause heart problems too. According to the American Heart Association, people should not consume more than 1500mg of sodium in a day. But if you are having low blood pressure increase your salt intake in moderation to raise blood pressure. Sprinkle salt to your food and avoid processed food. Using salt while cooking helps you to keep a track of your salt intake and improves heart health. Alcohol consumption can lower your blood pressure. Limit your drinking alcoholic beverage to no more than two drinks a day, as recommended by AHA. For women, it should not be more than 1 drink a day. If it is difficult for you, talk to your healthcare provider. You might also feel dehydrated due to excessive alcohol drinking. Drinking alcohol while taking medications also lead to low blood pressure. Sometimes mild dehydration also causes hypotension. Loss of water due to strenuous exercise, vomiting, fever, can lead to dehydration. Drink water at small intervals to help you stay hydrated and increase blood volume. Eliminate a potential cause of low blood pressure by drinking water. Eating a balanced diet at frequent intervals helps lower the blood pressure. Include fiber-rich foods in your diet like fruits, veggies, whole grains etc. to keep a check on your habits by maintaining a diary of what you eat. Eating low-calorie foods at short intervals helps in preventing low blood pressure. Also include foods high in B12 like eggs, cereals, chicken, breast meat, and salmon. Leading a sedentary lifestyle can lower your blood pressure. Increase your physical activity by doing some aerobic exercises, yoga or even brisk walk for an hour which will help you to keep your weight in check and raise blood pressure. Regular exercise increases the oxygen consumption which makes the heart pump blood efficiently and thus maintaining normal blood pressure. You can complement your exercise with a post-workout whey protein drink to regulate normal blood pressure. Optimum nutrition whey can be a good choice for your post-workout protein shakes. Elastic stockings or socks can help prevent swelling in your legs because of blood pooling in your legs. Postural hypotension occurs due to a long time standing, sitting in a single position. Wearing compression stocking helps in relieving it. This is common in older adults who are advised bed rest and need stocking to pump up the blood. Doctors recommend medications like fludrocortisone to treat low blood pressure. This medication increases the blood volume, thus bringing your blood pressure to normal. For people with orthostatic hypotension, doctors recommend the drug midodrine to raise the blood pressure. This medication raises the blood pressure by restricting your blood vessels from expanding. When your blood pressure gets low, have a cup of tea or coffee as it increases your blood pressure. Caffeinated beverages help in the circulation of blood. Studies show that drinking coffee can temporarily increase your blood pressure. The antioxidative effects in coffee help in reducing oxidative stress in the body that helps in maintaining heart health and also raising the blood pressure for the next few hours. This healthy drink made from ground almonds is getting popularity as a substitute for cow’s milk. This drink is rich in potassium, vitamin D, and is lactose and dairy free. You can drink this milk every day to keep your blood pressure normal without falling. The potassium content in almond milk keeps your heart health and your blood pressure levels in check. You can also include almond in your diet by adding it to your cereals or smoothies. Basil or tulsi offers multiple therapeutic benefits. It is rich in vitamin C, magnesium and potassium that offers health benefits like anti-inflammation, and cardioprotection. According to a study conducted in 2013, vitamin C, Potassium, and magnesium present in Tulsi works in combination and helps in normalizing the blood pressure. Basil leaves contain an antioxidant called Eugenol that keeps the blood pressure normal and lowers cholesterol levels. Always consult your doctor before taking any medication. The above tips work well if you follow a healthy balanced diet. Remember, blood pressure, diabetes is all lifestyle-related issues, which is ultimately in your control and your choice. Author bio: Harold Camaya is a blogger who loves to write an articles in various verticals. She co-authored supercharge organic traffic: A familiar course targeting on organic traffic for Ecommerce platform. Espcially Harold Camaya's hobbies are traveling & reading.